To mark the 100th anniversary of a legendary castaway tale we have created the Cornwall Castaway activity. Do you have what it takes to survive a shipwreck and relive the folklore of brave lifeboat men? Learn wilderness and coastal survival skills on our historic Cornwall Castaway activity. In December 1917 a terrible storm battered the coast of Newquay. The Osten, a local fishing boat got caught in the storm and washed over the notoriously dangerous Cribbar reef – a modern day big wave surfing spot where waves of up to 30-40ft break over shallow jagged rocks. The alarm was raised and horses pulled the lifeboat to the slipway on Towan Headland. However, on arrival at the scene, the lifeboat’s new coxswain refused to launch in such weather and waves. Despite his orders, former cox Gill resisted saying he had been out in worse and formed a maverick crew volunteers to rescue the Osten. Much to the delight of onlookers the lifeboat set sail under Gill’s command, but the boat was quickly tipped by a huge wave. Her sails quickly filled with water meaning she could not self-right and the crew were washed overboard and into the cliffs. Using their local knowledge of the coastline, the crew traversed their way to the relative safety of a cave known as the Tea Caverns – a smugglers cave throughout the 17th – 18th century for smuggling tea, brandy and silk – all heavily taxed at the time. Do you think you’d have the metal to traverse Newquay’s craggy cliffs while the Atlantic swells crash beneath you? The storm raged for the following 3 days and 3 nights forcing the crew to weather it out in the cave. The men foraged for seagull eggs, crabs and shellfish and built fires from driftwood to cook and fend off the onset of hypothermia. When the storm finally passed the crew were rescued and awarded RNLI gallantry medals on their return to land. Would you have the knowledge to survive in such an unforgiving environment? You’ll be challenged on every level in a myriad of wilderness & adventure scenarios: wild swimming, coasteering, survival skills and navigating a rescue raft back to shore. It’s no easy feat and to become a true Cornwall Castaway you must successfully complete every wilderness & adventure challenge. 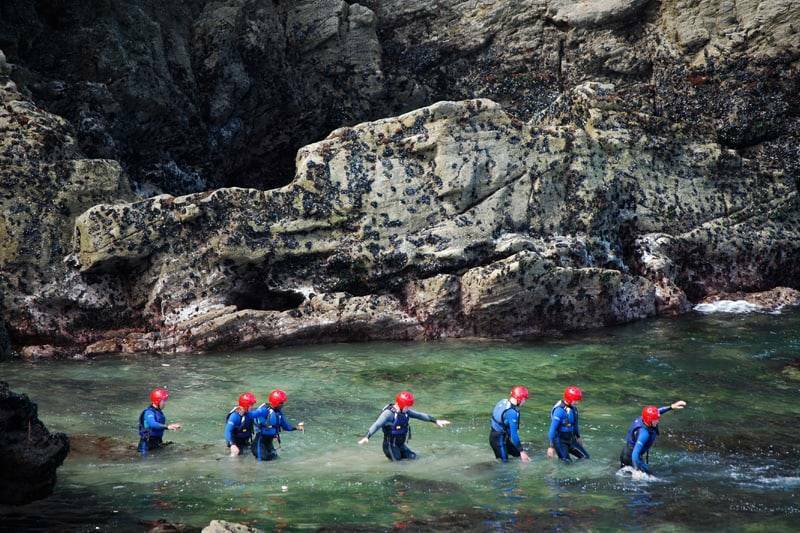 On arrival at the Newquay Activity Centre one of our experienced instructors will kit you out in a wetsuit, buoyancy aid and helmet and lead you to the beginning of your Castaway adventure. Shortly after being ‘shipwrecked’ your objective is make dry land by means of wild sea swimming, climbing and traversing your way along the rocks, riding sluices (nature’s natural rapids) and diving into deep water plunge pools. This stage of the activity draws on a number of physical and technical skills as well as mental capabilities in terms of fear management and confidence. On arrival at Dead man’s cove, your service men and women’s survival skills will be put under the microscope. Here they’ll learn how to identify our rich marine and bird life, forage for edible food and collect suitable fuel to build a fire. The survival skills covered on this leadership program are directly transferable to operational capabilities and lend themselves well to testing your troops resourcefulness and moral building attributes. On completion of the survival skills phase, the troops will face the challenge of escaping Dead man’s cove on our Super SUP. Here, working as team they will learn how to effectively launch & land the craft, perform efficient paddle strokes both standing up and kneeling down and steer & control the craft. The troops will also be given a point-to-point navigation exercise to complete before returning to shore. By this late stage of the course, the troops’ stamina and mental endurance is called upon one last time, as well as team working, communication and orienteering skills; all attributes transferable to operational effectiveness. The Cornwall Castaway is a well rounded leadership program that offers a little bit of everything and more; a good blend of physical and mental challenges that will push personal boundaries to their limits. But most of all it’s a really fun day out!